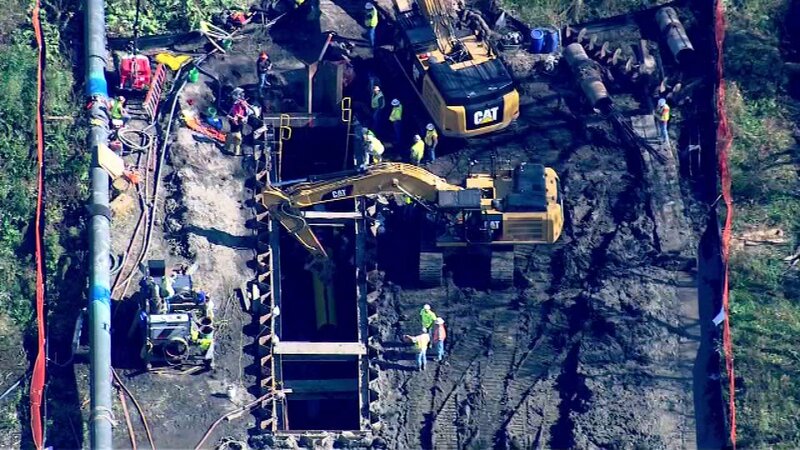 PINGREE GROVE, Ill. (WLS) -- Emergency responders were called to the far northwest suburb of Pingree Grove on Friday afternoon after reports that a worker fell into a hole on top of another worker. City officials said while constructing a new gas line, a worker fell approximately 10 feet into the hole and struck another worker, inuring both. Due to their injuries, neither worker could exit the hole on their own. The worker was pulled out of the hole on a stretcher by emergency personnel using a crane. The second worker was pulled out a short time later. One worker was taken by ambulance to Advocate Sherman Hospital for treatment, and the other was flown by Flight for Life to Condell Hospital for treatment. Elgin Fire officials said the worker that was airlifted to the hospital has subsequently been released and neither worker sustained life threatening injuries. The incident occurred at a worksite near Big Timber Road and Mccornack Road. Worker pulled out of a hole on a stretcher by emergency personnel using a crane.